The EU's foreign affairs chief Catherine Ashton has said she is "very concerned" about the unrest in Kyrgystan and has called for a stable government. At least 117 people have been killed in the ethnic clashes so far. Speaking to reporters as she arrived for a meeting of European Union foreign ministers in Luxembourg, the bloc's chief foreign policy representative, Catherine Ashton, said she had been in touch with the EU's special representative for Central Asia, Pierre Morel, who she said would be going back to the region to find out how the EU could help. Ashton said she "was very concerned" about events in Kyrgyzstan over the weekend, where running street battles, according to the Kyrgyz Health Ministry had claimed at least 117 lives and injured at least 1,500 others. Accounts from international aid agencies, like the International Red Cross, and other witnesses suggest that the real figures could be significantly higher. Mobs of Kyrgyz rioters have attacked and killed ethnic minority Uzbeks in the southern city of Osh, burning their homes and businesses. 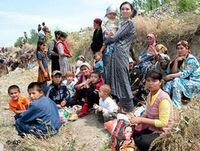 International media say streams of refugees are crossing into neighboring Uzbekistan. More than 80,000 ethnic Uzbeks reportedly fled across the border on Sunday alone. Ashton said it was "very important" that all parties "move forward in the way they were planning to do, to try and sort out a stable government." The country's provisional government has struggled to impose order since coming to power during deadly riots that ousted Kurmanbek Bakiyev in April. The United States and Russia have warned of the risk of civil war in the strategic state, which uniquely hosts both a US airbase outside the capital Bishkek vital to operations in Afghanistan and several Russian military bases. 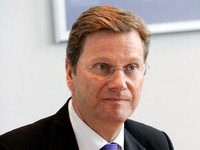 German Foreign Minister Guido Westerwelle on Sunday called for an end to the violence. "I am very concerned about the continuing tense situation and the conflict in southern Kyrgyzstan, which has already cost so many human lives," he said in a statement. "I appeal to every side to cease the violence immediately." "We are in close contact with the Kyrgyz interim government, the United Nations and the European Union to examine what can be done to help those in need," Westerwelle said. Germany is the only European Union nation with an embassy in the central Asian country. "The mission of the force that has landed is to reinforce the defense of Russian military facilities and ensure security of Russian military servicemen and their families," the source was quoted as saying. 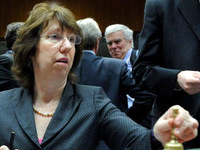 The European Union said on Saturday it would send experts to evaluate the humanitarian situation. Amnesty International has called on the interim government, led by Roza Otunbayeva, to protect the country's Uzbek minority. "Amnesty International urges the Kyrgyzstani interim government... to ensure adequate protection for all Kyrgyzstani citizens and in particular those of Uzbek origin who have been targeted during the violence," the organization said in a statement. 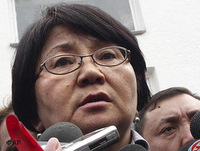 Otunbayeva's government has so far been unable to contain the violence and gave the police and military shoot-to-kill orders. A round-the-clock curfew has been imposed in Osh and two neighboring districts, and a state of emergency has been declared. On Saturday, Otunbayeva appealed to Russia for military support in containing the unrest. Moscow initially declined to send troops, saying the conflict was an internal matter. Russian President Dmitry Medvedev's spokeswoman, Natalya Timakova, said Russia would offer humanitarian assistance and "help evacuate those wounded in Osh." Timakova said any decision to send peacekeepers would only be made after consultations with the United Nations.